Everyone met at Heathrow Airport for our early morning departure to Madrid, where we connected with our flight to San Jose, Costa Rica. On our arrival in the early evening we got through the customs formalities and then met with Kevin Easley, Costa Rica’s number one bird guide and a good friend of mine. We were then taken to our lovely hotel by Pablo our coach driver and here we enjoyed an excellent evening meal before retiring for a well deserved nights sleep. Everyone was up at 6.00am including Rob and Sue who hadn’t arrived until much later the previous night via a different flight from Edinburgh. We met in the hotel gardens and then set off on a search of the allotment and flower beds. Clay-coloured Thrushes were everywhere and we soon added Greyish Saltator, Bronzed Cowbirds, Great-tailed Grackle and Rufous-collared Sparrow. While Kevin staked out the allotment with half the group I took the rest and we checked out the other side of the extensive gardens. Both groups got superb perched views of Crimson-fronted Parakeets, while we added Melodious Blackbird, Tennessee Warbler and Rufous-tailed Hummingbird. Kev’s stake out paid off for one species and his group saw White-eared Ground-Sparrows. We swapped places until the main target bird of the gardens was found and everyone joined together and enjoyed excellent views of the very localised Prevost’s Ground-Sparrow. With Baltimore Oriole and a brief Rufous–capped Warbler adding some colour we then had our breakfast, packed our luggage onto the coach and Pablo our driver set off towards the pacific coast. Our first stop along the way was a small town with a park in the centre, where we immediately got superb views of a roosting Black-and-white Owl and very close looks at a Yellow-green Vireo. We soon moved on and before long we were searching the grassland area of a new site. Scissor-tailed Flycatcher was added to our lists along with two adult and a juvenile Double-striped Thick-knee stood in an open grassy field. A flowering tree beside us produced superb views of a Plain-capped Starthroat, but only brief views of Cinnamon Hummingbird and a Green-breasted Mango. In the tree tops a Yellow-olive Flycatcher proved a little difficult to find. Moving on a little we spotted a Black-headed Trogon followed by a group of birds that included Banded Wren, White-lored Gnatcatcher, Stripe-headed Sparrow and Brown-crested Flycatcher. Further stops produced a delicate looking Nutting’s Flycatcher, a wonderful Grey-headed Kite perched just a few feet off the ground and a Striped Cuckoo motionless on the top of a tree. Beside a river we soon added gorgeous Long-tailed Manakins and a Bare-throated Tiger-Heron and with a more thorough search of this area we found Violaceous Trogon, Red-legged Honeycreeper, Northern Beardless Tyrannulet, more Long-tailed Manakins, Barred Antshrike and an Olive Sparrow. It was now quite hot and humid and time to move on. A couple of unscheduled roadside stops got us views of Crested Caracara and some White-throated Magpie-Jays, plus a perched Grey Hawk. Moving on to our accommodation at Villa Lapas, we arrived in time for lunch. Afterwards we took a short drive to the edge of the Tarcoles river where we set off on our boat ride into the mangroves. We were soon seeing Snowy Egret, Little Blue Heron, an immature Yellow-crowned Night Heron, Roseate Spoonbill, White Ibis and skulking in the bushes overhanging the river was an outrageous looking Boat-billed Heron. We then found an Osprey sat in a tree and a couple of Mangrove Black Hawks posed nicely, while a Yellow-headed Caracara walked along the shore very close to us. Waders included Spotted Sandpipers, Ruddy Turnstone, Least and a single Western Sandpiper. We then spotted Hudsonian Whimbrel, Grey Plover, Semi-palmated Plover, Great Blue Heron, several Green Herons and both Green and Belted Kingfishers. As we slowly made our way up river a Mangrove Hummingbird was spotted but didn’t stay long enough for all to see. We then found Northern Waterthrush and a Magnolia Warbler, and an American Pygmy Kingfisher was spotted and after a little searching we found it sat on some roots on the bank. We then cruised quietly up a small creek seeing a couple more very close American Pygmy Kingfishers, plus Mangrove Warblers, Northern Waterthrush and some of us got brief views of the seldom seen Rufous-necked Woodrail – a very good bird! Turning around and making our way slowly back, Russ relocated the Woodrail and this time we manoeuvred the boat and everyone on board got excellent views including a time when it walked right out in the open. As we made our way back we noted a couple of Plumbeous Kites circling over the forest and closer to dock we got to see lots of Lesser Nighthawks hawking for insects. We took an early breakfast and managed to see a Short-tailed Nighthawk hawking low over the river beside the restaurant area. We then collected our gear and joined the coach where Pablo drove us the short distance to the Tarcol river bridge. Our main target species was soon found by Rob who had spotted a couple of Collared Plovers. After everyone had seen these we scoured the area adding Least Sandpiper, Black-necked Stilt and a couple of fly over Red-lored Parrots. Near to where the coach was parked we watched Inca Doves, Blue-black Grassquits and Plain Wren, Cherries Tanager and some Yellow-headed Caracaras. As we were about to leave a Grey-crowned Yellowthroat popped up onto the top of some tall grass. We then drove to the start of the river trail that goes into the fantastic Carara National Park – a huge and very extensive forest. We spent all morning covering no more than 4 or 5 hundred yards. We started off with Western Long-tailed Hermit coming to some Heliconia plants and then a great spot from Ian of a pair of Ruddy Quail-Doves with the male showing exceptionally well sat on an open log. We also got to see Orange-billed Sparrows and a superb Northern Royal Flycatcher preening itself for over five minutes. Rufous-and-white Wrens showed well but a very vocal Green Shrike-Vireo proved impossible to see. As raucous Scarlet Macaws flew over we slowly continued on. A Greenish Eleania and Dusky-capped Flycatcher were added and we all got superb views of a pair of Slaty-capped Tody-Tyrants. Inside the forest we watched the amazing display of several beautiful Orange-collared Manakins while a nearby dead tree held two very attractive Golden-naped Woodpeckers. Next was a Ruddy-tailed Flycatcher building a nest and in the same spot we watched Dot-winged Antwrens. Back on the track Grey-headed Tanagers showed well, we saw Long-billed Gnatwren and then some movement attracted our attention to a small ant swarm. We eventually positioned ourselves within the forest and close to the swarm where we had a fantastic half hour. As we watched Grey-headed Tanagers flitted all over the place, a very bright Ruddy Woodcreeper gave superb views and a family of two adult and four young Bi-coloured Antbirds out performed the duller Chestnut-backed and Dusky Antbirds. Two Northern Barred Woodcreepers showed well, but a Black-faced Antthrush ran away before most people even new it was there. We then added Black-hooded Antshrike and a bright Tawny-winged Woodcreeper – what an exhilarating time! Back on the main track we continued on and found a Blue-black Grosbeak as well as Brown-hooded Parrot and a Red-legged Honeycreeper. Back again into the thicker forest and the next bird to arrive on our list was an obliging Rufous Piha shortly followed by excellent views of a pair of Golden-naped Woodpeckers, a Baird’s Trogon and then a perched Crane Hawk. Russ found a Green-and-black Poison Dart Frog beside a log and as we returned a group of White-faced Capuchin’s were seen well. We then made our way back to the coach and returned to our lodge for lunch. Afterwards we returned to the forest but this time to a different trail. This dark narrow forest trail proved very hard work and slow to work, but perseverance once again paid off as we started with Black-throated Trogon, Cocoa Woodcreeper, Riverside Wrens, Rufous-bellied Wren, Summer and White-shouldered Tanager, and a nice Rufous-tailed Jacamar which showed well. Further on and overlooking a small stream, an hour of watching produced fabulous views of Red-capped and Blue-crowned Manakins coming in to bathe plus Olive-striped Flycatcher, Buff-rumped Warbler and also a very loud Thrushlike Schiffornis which we got even better views of again later. We moved on and continued our search eventually adding noisy Mealy Parrots, a very easily watched White-whiskered Puffbird and then two amazingly showy Black-faced Antthrushes. As our finale to this patch of forest we all got wonderful close views of a Great Tinamou right out in the open. We met Pablo with the coach and returned to the lodge ready for dinner and our regular roll call. Those that wanted to we then went on a twenty minute drive at night to an area we often see Striped Owl. We were not to be disappointed and after one circuit of the area we heard the distinctive call of a young bird. We got excellent looks at this bird sat in a tree and afterwards we saw a Common Paraque sat on the road and finally but all too briefly an adult Striped Owl which never sat long for everyone to see. At breakfast a Short-tailed Nighthawk was once again seen flying around low over the river. We then set off towards Tarcol lodge. A stop beside a small pool produced a Solitary Sandpiper and Green Heron but the highlight had to be the close views we got of a Mangrove Hummingbird feeding low on a flowering tree. We also had excellent looks at a Ruby-throated Hummingbird doing the same. Next we set about following a path through the grassy fields and scattered trees towards the mangrove. A Turquoise-browed Motmot showed well, and a lot of bird activity in the top of a bare tree included Blue-throated Goldentail, Green-breasted Mango, Scrub Euphonia and the cause of all the commotion a Ferruginous Pygmy-Owl. Next was a family of Yellow-naped Parrots sat in a tree top shortly followed by a White-fronted Parrot. 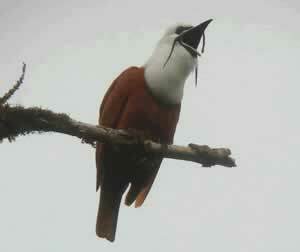 A Squirrel Cuckoo appeared as did an obliging Panama Flycatcher and Boat-billed Flycatcher. Both Streaked Flycatcher and Streak-headed Woodcreeper were watched on a dead tree and a little further on we all had wonderful views of a pair of Scrub Greenlets and a Southern Beardless Tyrannulet. In the skies above a Crane Hawk, Short-tailed Hawk and Mangrove Black Hawk circled around together. We then entered the mangrove and followed a track where we soon found Scrub Flycatcher and Mangrove Vireo. A little further in we spotted Tropical Pewee, Northern Waterthrush, Rose-throated and Cinnamon Becard and also a Lesser Nighthawk on a daytime roost. Once we had reached the other side of the mangrove it was a short walk to Tarcol lodge in time for a welcome drink of juice and some biscuits. A close look at some waders produced Western and Least Sandpipers, Short-billed Dowitchers, Greater Yellowlegs, Semi-palmated Plover and Spotted Sandpiper. A couple of huge Wood Storks flew in and several Yellow-crowned Night Herons were seen. Above the distant trees flew Plumbeous Kites, Crested and Yellow-headed Caracara, Osprey and Mangrove Black Hawk. With some of the group making the sensible decision to bird from the veranda of the lodge the rest of us set out in the burning sun to walk along the beach to reach the gull and tern roost at the far end. It certainly was hot! On the beach Willet and Sanderling were seen and a few Laughing Gulls drifted by out at sea. An amazing find was had when an Upland Sandpiper took off and did several short flights through the drift wood. We then stumbled across several Lesser Nighthawks sat just a few feet in front of us on logs and bits of driftwood. Once we reached the end and having seen a couple of Wilson’s Plovers along the way we were treated to excellent views of a small high tide roost. Amongst the many Laughing Gulls and Brown Pelicans were lots of Royal Terns, a few Sandwich Terns, about fifteen Black Skimmers and a single Elegant Tern which allowed good comparisons sat beside a Royal. Oh I nearly forgot the superb skinny little Vine Snake we saw. We headed back towards the lodge seeing more Wilson’s and several Collared Plovers and once again we got flight views of the Upland Sandpiper. Once back we boarded the coach and returned to our own lodge. After lunch we set off to Carara and the river trail. We had not gone far when a small flock appeared including White-winged Becard and Tawny-crowned Greenlet, a Purple-crowned Fairy showed very well as we also looked at a male Painted Bunting found by Russ. Further along we got into a little trogon mania and had excellent views of up to four Baird’s Trogons sat in the sunlight plus a nice male Black-throated Trogon. Brian C then spotted a Fiery-billed Aracari at the top of a huge tree where we all got to see this superb bird. As we watched Dot-winged Antwrens and a Chestnut-backed Antbird, Kev beckoned us into the forest where a Streak-chested Antpitta could be heard calling. Slowly creeping through the forest we eventually found it and everyone got fantastic close views as it sat on top of a small log and just called away. It also turned around and showed us all its angles in excellent light. After our long search for this species yesterday we all left feeling very pleased. Further on we got to see an adult Grey Hawk sat in a tree top with a Slaty-tailed Trogon and a Northern Bentbill seen nearby. Turning around we started to head back when suddenly four Crested Guans flew into a tree shortly followed by a Chestnut-mandibled Toucan. This morning we had an early coffee and set off towards Tarcol Lodge. A stop beside a wet area had us position ourselves for a five minute wait. We soon enjoyed excellent views of two Grey-necked Woodrails walking slowly through the wood edge, as well as a Ferruginous Pygmy-Owl which sat obligingly on an open branch. Moving on to an area of roadside scrub and grass we walked a small section of road where we soon found Scrub Euphonias and a Laughing Falcon sat in a tree. A male Blue Grosbeak was also seen as well as Black-striped Sparrow. Pablo called us over after he spotted a bird fly into some nearby trees and on further investigation we found and got superb views of a Collared Forest Falcon which had probably just taken an Iguana. With Streak-headed Woodcreeper and Melodious Blackbird showing well we left and drove to the high hills above our lodge. We stopped on a sunlit corner where bird activity slowly picked up. Yellow-throated and Philadelphia Vireos were seen as well as Yellow-bellied Flycatcher, female Painted Bunting, Northern Bentbill and Ian spotted two Fiery-billed Aracaris flying away. Further up the road we saw a Great Crested Flycatcher before continuing our drive to a lookout at the top. Overlooking the huge expanse of forests a White Hawk was spotted flying far below us and it even perched a few times where it stood out like a light bulb. With a little more patience we saw two Zone-tailed Hawks before the major prize of a magnificent King Vulture which flew right overhead. Happy with this we set off back towards the lodge for our later than normal breakfast. One quick stop along the way added a female and then a immature male Western Tanager to our list. After breakfast we loaded our luggage onto the coach and set off towards the dry Guanacaste. We stopped briefly at a gas station to pick up a few little snacks for our lunch and then we continued on to an area of salt pans. Along the approach road we spotted some orioles, so everyone got out and we soon found and got excellent views of Streak-backed and then Spot-breasted Orioles. A Lesser Ground Cuckoo was heard calling so we tried to entice it closer. It wasn’t long before we had our scopes trained on one of these skulky birds just sat motionless in the short grasses. Moving on to the salt pans a couple of Double-striped Thick-knees were seen after which we walked a short way to look at several pools. Little Blue Herons and White Ibis were obvious, as were Willet, Hudsonian Whimbrel, Least Sandpiper and Semi-palmated Plovers. We could see a flock of terns in the distance so we drove around to the other side to get better views. A short walk found us the roosting flock where we scanned through and found mostly Royal Terns, a few Sandwich and a couple of Gull-billed Terns as well as twelve Black Skimmers. Amongst the wading birds were close Lesser Yellowlegs, Least Sandpipers and Western and a few Stilt Sandpipers. Russ managed to extract a couple of Semi-palmated Sandpipers which allowed good comparisons alongside its similar cousins. We left and continued our journey towards our next lodge. A short stop at the gas station produced a Grey Hawk as well as House Sparrow and a scruffy White-collared Seedeater. Our next roadside stop was due to an excellent spot by Brian P and once out of the coach we all enjoyed super views of up to ten Spot-bellied Bobwhite on the edge of a field, as well as Roadside Hawk and Scissor-tailed Flycatcher. Moving on another stop produced a male American Kestrel as well as White-throated Magpie-Jays. Calling in on a newly built lodge we checked out the fishing lagoons behind it. A Ringed Kingfisher showed well and up to three Least Grebes, Laughing Falcon, and two Muscovy Ducks were found. Arriving at our lodge we had a short time to just check the grounds. A few kingbirds were moving through and after checking about a dozen Tropical Kingbirds, a single Western Kingbird was found. The subtle differences not being that obvious on this rather worn individual. and a Plain-capped Starthroat. Another similar stop further along produced another Canivet’s Emerald but it wouldn’t stay long enough for all to see, and amazingly we had two more Plain-capped Starthroats, and a White-lored Gnatcatcher. Several Roadside Hawks were seen and then a perched Laughing Falcon, and on a distant tree a Peregrine Falcon was spotted. Moving on a Yellow-naped Parrot flew across in front of the coach and then as we approached a more wooded area we found up to three Mangrove Cuckoos with the last two showing particularly well. Passing beside the rice fields we noted many Red-winged Blackbirds, Egrets, Bare-throated Tiger Heron and a showy Limpkin. We stopped and searched a section of dry forest where we found a nesting Streak-backed Oriole followed by a Black-headed Trogon and then Costa Rica’s most difficult trogon with good views of two Elegant Trogons. Within the same forest White-tipped Doves were everywhere and a group of Mantled Howler Monkeys were watched sat in a tree while amongst the sticks below, an eight foot long Neotropical Indigo Snake slithered away. Back on board the coach we continued on to the research station and had a look over what was until recently a wet marsh. It now looked as though it had dried up but one small reed surrounded area still looked promising. As we scanned the area Ian found our target species, two enormous Jabiru sat way out in the middle. We decided there must be water there so we walked out to investigate. Sure enough we not only got superb views of the Jabiru but also hundreds of Black-bellied Whistling Ducks, some Blue-winged Teal, five Shoveler, Glossy Ibis, Northern Jacanas, Limpkin and a single and difficult to see Fulvous Whistling Duck. Above us a Zone-tailed Hawk showed well as did an immature Harris’s Hawk. It was now very hot so we returned to the centre and found some shade and some cool drinks. After searching many trees and Kev telling me where a Pacific Screech Owl was nesting, we happened to be in a very different position when I noted the same spot had an obvious hole and there looking out at us was the owl! What a great surprise. After getting superb views we had our lunch. Afterwards we checked another area of forest but found very little, barring a Roadside Hawk, a whole bunch of howler and capuchin monkeys lazing about and a roosting Lesser White-lined Bat. Back on the coach we set off and had one last check of another wet area. A couple of Anhingas were seen and amongst the many Black-bellied Whistling Ducks was a single Fulvous Whistling Duck giving much better views than the earlier bird. Further on we checked a couple of nice looking open water pools where Bare-throated Tiger-Herons and a Tri-coloured Heron showed well. It was now time to make our way out of the park and head towards the cooler climbs of Monteverde. Very little was seen until we got much higher when a stop to look at two Keel-billed Toucans proved perfect as we looked down on them in superb light conditions. A little further along and a group of huge White-collared Swifts flew low in front of us producing excellent views. The rest of the journey along the bumpy old road was either enlivened or made worse depending on your view by Kev getting hold of the mike and proceeding to sing a medley of old and obscure songs. Still, we eventually arrived at the lodge with our hearing still intact and after checking into our rooms we enjoyed a sumptuous dinner. A few of the group were out and watching from the front of their cabins early morning prior to breakfast. A couple of interesting mammals were watched well, likened to the African Honey Badgers, these were called Greater Grisson’s. Also seen was a very showy pair of Yellow-throated Brush Finches. We had breakfast with a short distraction as a tree just outside the restaurant held Yellow-throated Euphonias and Red-legged Honeycreepers. We then set off to visit the nearby Monteverde Cloud Forest Reserve. A short roadside stop along the way produced several good species including Blue-throated Toucanet, Red-faced Spinetail, White-throated Thrush, and some excellent views of Golden-browed Chlorophonias. While Kev sorted out the entrance tickets we had a quick look at the hummingbird gallery where six or more sugar water feeders attracted several hummers including Violet Sabrewing, Green-crowned Brilliant, Purple-throated Mountaingem, Stripe-tailed Hummingbird, Green Violetear and the tiny endemic Coppery-headed Emerald, as well as a Bananaquit. Walking up to the entrance gate a few of the group had brief views of a Resplendent Quetzal before it flew off and disappeared into the forest. While looking for it everyone got to see a Black Guan sat high up in a tree. We then set off following one of the narrower trails that wound through this pristine forest. A Black-faced Solitaire was seen while many more were heard singing, and we got brief views of Grey-breasted Woodwren and several more White-throated Thrushes. The raucous call of an Azure-hooded Jay had us quickly moving to the area and then enjoying excellent views of two very attractive birds. Above us a Mountain Thrush was seen while nearby a Slate-throated Redstart showed well. We continued quietly on and soon found a pair of Orange-bellied Trogons – a distinct race of Collared Trogon followed by varying views of a close Slaty-backed Nightingale-Thrush. Down beside a waterfall some beautiful butterflies flew around while a small group of tanagers held both Spangle-cheeked and Silver-throated. As we made our way back a Spotted Barbtail was found while above the tree line a magnificent Swallow-tailed Kite circled around. We then waited on a corner and kept our eyes on a couple of holes in an earth bank. A five minute wait paid great dividends when a Grey-throated Leaftosser flew in and perched beside its nest hole carrying a grub for its young that were obviously inside – what a superb sighting! Low in the bushes a couple of Three-striped Warblers showed themselves while further on and high in the canopy we got to see a pair of Ochraceous Wrens and fabulous views of a group of Golden-browed Chlorophonias plus several Common Bush Tanagers, but two Chestnut-capped Brush Finches proved very difficult to see. Leaving the park we had another look at the hummingbird gallery and added the gorgeous Magenta-throated Woodstar to our list, while in a telegraph pole nearby a Hairy Woodpecker popped its head out of its nest hole before disappearing into the forest. We returned for an enormous lunch and short break, and once back on the coach we returned to the reserve. Straight away a Resplendent Quetzal was heard calling and just a few yards into the forest we enjoyed fantastic views of a male bird sat out in the open showing us exactly why he is considered one of the most beautiful birds in the world. Another Slaty-backed Nightingale-Thrush was also seen and we found Yellowish Flycatcher plus typically brief flitting views of a Silvery-fronted Tapaculo. We slowly made our way along the same trail as the morning and as we rounded a corner John, Pat and Kev were the only ones to see a Highland Tinamou before it walked off the track and into thick cover. A little further on and we were all treated to wonderful close views of five Black-breasted Wood-Quail whose finale was to walk right across the open track just a few feet in front of us. On our way back we tried another Silvery-fronted Tapaculo and this time if you were lucky, reasonably good views could be had as this avian mouse moved through the thick tangles. Back outside the park we ended the day by having a last look at the hummingbirds. All the previous species showed well including the Magenta-throated Woodstar, Striped-tailed Hummingbird, Coppery-headed Emerald and even a Green Hermit. A fitting way to end a great day we returned to our lodge. This morning we had a quick hot drink and then drove to the nearby Finca Ecologica Reserve. Kev soon found an Ovenbird which promptly disappeared while in the opposite direction I located a White-eared Ground Sparrow. Several Central American Agoutis were seen but a quick search failed to find our target quail-dove. Back aboard the coach we drove to St Luis following a twisty steep road down into this lush valley. Once here we got out and walked a section of road, and in the far distance the resounding ring of a Three-wattled Bellbird could be heard. Heading in that direction we first found an Orange-billed Nightingale-Thrush which was seen well by some of the group and we got to see a Rufous-browed Peppershrike which perched briefly. The bellbird sounded closer and the excitement mounted as we searched for a high point from which to observe the forest canopy. Crossing through a rough grassy field we got to an area where we felt we must be able to spot him. Not quite, so we made our way through some bushes to a higher observation point and in so doing we got stung by little bees or flies – well you have to suffer sometimes for a good bird and once through and over the stings we scoured the tree tops where sharp-eyed Ian let out the words we were waiting for – I’ve got it! And sure enough within seconds our scopes were trained on this large chestnut and white cotinga giving it his all from a dead tree – wow what a sight! Very happy we made our way back to the coach seeing Paultry Tyrannulet, Blue Dacnis and Plain Wren along the way. Back at the lodge we had breakfast and then drove back to Finca Ecologica. On the approach road an Ovenbird flew across so we got out and some of the group managed to see it. We checked around the information centre and saw several White-nosed Coatis, plus more Agoutis. Splitting up we then quietly searched the narrow forest trails. While some of the group watched an Orange-billed Nightingale Thrush, Russ noticed a quail-dove stood looking at him and a few of the group. It then started to walk through the leaf litter and Russ, Brian C, Jo, Ian and Brian P all saw our target bird a Chirique Quail-Dove. The rest of us were soon on the scene but not soon enough as it had disappeared and despite extensive searching could not be found again. More views were then had of Orange-billed Nightingale-Thrush as well as White-eared Ground Sparrow, Wood Thrush and even more Ovenbirds. Some people also saw Long-tailed Manakins while a Golden-olive Woodpecker showed very well to everyone. We also got to see a close Canivet’s Emerald feeding on the Vervain flowers while another section of woodland produced a Swainson’s Thrush, Golden-crowned Warbler, and an Olivaceous Woodcreeper. Beside the coach we finished off with Tennessee Warbler and Yellow-throated Euphonia, while Black-and-white Warbler had been seen by some a little earlier. Back to the lodge we packed our bags and set off towards lake Arenal and its famous volcano. A few birds were noted along the way such as Swallow-tailed Kite and Scissor-tailed Flycatcher and beside our lunch stop we got to see Northern Rough-winged Swallows, Blue-throated Toucanets and a stunning male Scarlet Tanager. Moving on we drove along the edge of the enormous lake eventually stopping when an Amazon Kingfisher was spotted sat on telegraph wires. We got to the dam where a short walk along the road produced Collared Aracari, Green Honeycreeper, Band-backed Wren and Variable and White-collared Seedeaters, Blue-black Grassquits and on the lake itself a Green Kingfisher. With too many tourists around and the volcano shrouded in thick cloud we continued on to our lodge which was sat right at the base of this still active volcano. Along the approach road we noted several Crested Guans going to roost as well as a few Keel-billed Toucans. We shortly arrived and sorted our rooms, had a lovely meal, went through our checklists and then prepared for tomorrows birding. appeared as did White-throated Thrush, Hepatic, Blue-grey and Golden-hooded Tanagers. Montezuma’s Oropendolas bullied everything else on the tables full of fruit and as we waited the rain ceased and we got great views of Black-cheeked Woodpecker, Bay-headed Tanager and a Wedge-billed Woodcreeper. Several hummingbirds came to feed on the small Vervain bushes just a few feet away and we soon enjoyed excellent views of White-necked Jacobins, Purple-crowned Fairy, Little Hermit and two female Black-crested Coquettes. A Black-striped Sparrow hopped around on the grass and we even got brief views of a Yellow-rumped Warbler, plus plenty of Tennessee Warblers and a Paultry Tyrannulet. It was now time for breakfast where we continued our vigil from the restaurant. Afterwards we set off on a short walk of the grounds. A White-breasted Wood-Wren showed very well and perched on a wire a Southern Rough-winged Swallow allowed scrutiny. We then found a Slaty-tailed Trogon while the nearby flower beds produced two Brown Violetears, Red-footed Plumleteer and sat in a tree was a superb male Black-crested Coquette. The call of a Black-throated Wren led us to the forest edge where the bird was found working its way through the thick tangles. An ant’s nest proved interesting and sure enough it wasn’t long before myself and Rob were watching an Ocellated Antbird sat motionless right out in the open. Unfortunately it was hidden from view from the rest of the group and disappeared when they tried to move position to see it. Not giving up we tried a few more spots for it but unsuccessfully. Back on the flowers all the same hummers except the coquette were there but now we had several Crowned Woodnymphs and a male Violet-headed Hummingbird. Taking a trail into the forest the Ocellated Antbird was heard and this time with perseverance everyone got stunning views of at least one of these beautiful birds. We searched for more wrens but only got to see Long-billed Gnatwren while Thicket Antpittas called from deep inside the undergrowth. Retracing our steps we watched a Black-headed Nightingale-Thrush, got excellent looks at two Stripe-breasted Wrens and further on glimpsed a pair of Spotted Antbirds and a couple of Yellow-billed Caciques. We returned to our rooms and got our luggage ready to move on. Driving slowly along the forested entrance road we made a quick stop and had very good views of a Bright-rumped Attila. Continuing on we stopped beside the lake where we got excellent views of Arenal Volcano and a close Pied-billed Grebe. Making our back towards the main road our next stop produced a very showy Long-tailed Tyrant plus a brief Black-cowled Oriole and Russ spotted a raptor which turned out to be an adult Ornate Hawk-Eagle which circled us calling and gave prolonged excellent flight views. The next stop found us a Broad-billed Motmot plus a pair of showy Russet Antshrikes, Tropical Parula and Chestnut-sided Warbler. We left the area and headed towards our lunch stop overlooked by the almost completely visible Arenal Volcano. As we enjoyed a good meal we added yet another hummer to our list in the form of a Long-billed Starthroat which kept returning to a large tree which also held a nesting Green-breasted Mango. Leaving hear we travelled a few kilometres up the road, jumped out of the coach and watched a great Costa Rican rarity, a pair of Southern Lapwings and their three tiny chicks walking around a grassy field. We then settled ourselves down for the drive to our superb lodge of La Quinta near the Sarapique river. A roadside stop just a short distance away produced a couple of Giant Cowbirds amongst the Bronzed Cowbirds and Great-tailed Grackles while above us Cliff Swallows flew around and a Laughing Falcon called from the top of a tree. We finished the last few kilometres and arrived at our lodge where we were to stay for the next three nights. This morning we had an early breakfast and drove to the entrance road to La Selva OTS. Pablo dropped us off and we slowly walked the road towards the gate and the reception building. Birds came thick and fast and we started with Golden-hooded, Blue-Grey, Palm and Passerini’s Tanagers, Cinnamon Becard, some Black-faced Grosbeaks, Rufous-tailed Jacamar and Black-cowled Orioles. As we moved along activity increased as two Green Ibis flew into a large tree and showed well, Pale-vented Pigeons were seen, Black-crowned Tityras landed in a tree top that also contained Summer Tanagers and Boat-billed Flycatcher, while overhead flew White-collared, Grey-rumped and two Lesser Swallow-tailed Swifts. 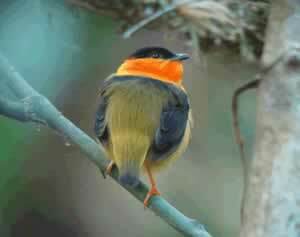 Also flying over were Shinning Honeycreeper with the males yellow legs clearly visible and both Cliff and Barn Swallows. We then got excellent views of a Yellow-tailed Oriole and nearby a male Great Antshrike. A Grey Catbird was found beside a nesting pair of White-ringed Flycatchers and even closer to the entrance two Grey-headed Chachalacas sat in a tree, Chestnut-mandibled Toucans posed nicely, Black-cheeked Woodpeckers were found and a female Snowy Cotinga flew into a tree top and showed very well, while nearby we had excellent views of a Chestnut-coloured Woodpecker. At the reception area we had a coffee and watched Violet-headed Hummingbird on the Vervain flowers. When everyone was ready we set off into the forest for the rest of the morning. It was already hot and humid and things were very quiet indeed. A Fasciated Antshrike was seen sat on a nest and then crossing over the river bridge we slowly made our way to the arboretum. Yellow-crowned Euphonias were seen and later we had superb views of a pair of Pale-billed Woodpeckers, plus Slaty-tailed Trogon, White-crowned Parrot and high in the canopy we added Red-eyed Vireo to our list. We also enjoyed very good views of a couple of Scarlet-rumped Caciques. Making our way back it was quiet until we crossed the other side of the bridge. A Rufous Mourner was spotted plus some very close Olive-backed Euphonias. Walking a short trail we found Fasciated Antshrike and then in another area we soon found a White-necked Puffbird sat in a large tree and at the same time a male Snowy Cotinga was spotted in a lower tree. Activity around the cotinga included Sulphur-bellied Flycatcher as well as three Eastern Kingbirds, which we watched before we turned around and headed back for lunch. Almost there and a few more sightings included a couple of Golden-winged Warblers and a male White-winged Becard. We then had our lunch and a short rest before returning to the forest. A perched Blue-chested Hummingbird was seen as well as Yellow-bellied Flycatcher and excellent looks at a Semi-plumbeous Hawk, but generally it was still very quiet. Things suddenly changed as we crossed a tiny bridge over a stream and there right beside us was one of the most beautiful herons you were ever likely to see, a stunning adult Agami Heron – simply fantastic! It continued feeding in the stream all the time we watched it and in Costa Rica this was a very privileged sighting. Reluctantly moving on, Jo spotted a very nice Rufous Motmot while above us a group of Crimson-fronted Parakeets fed noisily in a flowering tree. Turning around we started to make our way back, when to our delight we finished off in the forest with superb views of a female Great Curassow walking along and then climbing into a fallen tree. Back beside the coach we all enjoyed very good looks at several White-collared Manakins before loading up and moving out. A short stop along the entrance road had us use all our remaining concentration to try and see a close Little Tinamou, but the only one of us to succeed was Brian C with two views of this little skulker. After an early breakfast we set off towards Braulio Carillio National Park. A stop along the way at a fast flowing river failed to find our expected Fasciated Tiger-Heron, but we did get good views of a Louisiana Waterthrush and some Olive-throated Parakeets before the rain started. We soon arrived at Braulio and would you believe it the rain started pouring down. I know it’s a rain forest but it could have just held off until we’d had a look around. We sheltered for a while and then beside the entrance to the trail we had a quick look and all got stunning close views of a Dull-mantled Antbird. When the rain eventually eased a little we decided to set off on our walk. It was going to be difficult birding but we had to try and make the most of it. A view point produced distant views of a Tufted Flycatcher and we found a small feeding flock which contained Black-and-yellow and Olive Tanagers. Moving on we got wetter and wetter! Heading off a feeding flock, we only managed to add Tawny-crested Tanager to our list. We then struck success and found a pair of Lattice-tailed Trogons which performed nicely. As we headed towards the exit of the trail the rain eased and we got better views of Tawny-crested Tanagers, a Canada Warbler was seen and a Song Wren started singing. Everyone ended up with fantastic views of at least one of the pair of wrens and while watching these, an Olive-backed Quail-Dove walked past giving some of us a great view. The rest of the group skirted around and found two quail-doves creeping through the leaf litter, while those of us that remained with the Song Wrens also saw Black-headed Nightingale-Thrush, Wood Thrush and Ochraceous Wren. Hey! in all the excitement the rain had stopped and our ideas of abandoning our visit here changed, so we turned around and headed back along the trail we had just come. A Purplish-backed Quail-Dove was heard calling and eventually it was enticed closer where a few of the group saw it briefly. Moving on we then came across an ant swarm which is something you always hope for. At least three Barred Woodcreepers were seen well, while we worked on getting everyone views of Bi-coloured and Spotted Antbirds. A whisper from Kev that went something like – ‘Black-crowned Antpitta’ - got me excited and everyone else looking just ten feet away at one of the most amazing birds you could ever get on a trip to this country. Wow! It was a Black-crowned Antpitta and was not only a few feet away but was constantly sat on top of a log right out in the open! If only we could stop shaking one of us may have been able to get a decent photo of it! Moving on we started seeing more birds including brief views of Brown-billed Scythebill and a tricky little Scale-crested Pygmy-Tyrant. Further along we got the tail end of a big feeding flock and amongst the birds we saw were Sulphur-rumped Flycatcher, Buff-throated Foliage Gleaner, Tawny-capped Euphonia, a superb show from White-throated Shrike-Tanager, a Blue-and-gold Tanager, Tawny-crested Tanagers, Wedge-billed Woodcreepers and a brief Tawny-faced Gnatwren that got lost in all the commotion. Finally to finish off an amazing couple of hours birding we watched a pair of Black-chested Hawks lazily circle above the forest. The heavens then opened and we quickly made it back to the coach and a shelter where we then had our picnic lunch. The rain got heavier until it was torrential. We decided to leave and salvage the afternoon elsewhere. A coffee stop where the rain wasn’t! Beside a river, we saw an Amazon Kingfisher, and as hundreds of White-collared Swifts flew over we picked out a couple of Chestnut-collared, two Lesser Swallow-tailed and Grey-rumped Swifts. A short drive from here to a quiet rocky river soon found us our target bird, an adult Fasciated Tiger-Heron which showed well hopping from rock to rock in the middle of the river. A little further along we found a juvenile bird which allowed excellent close views as it fed quite unconcerned by our presence. Leaving here we headed back towards our lodge with a brief roadside stop that proved very productive, with excellent views of a Cinnamon Woodpecker, plus Grey Catbird and a distant male Snowy Cotinga. Our next stop at one of our secret marshes also proved very productive and a fitting end to an unbelievable day. We immediately found a very bright Indigo Bunting, followed by three species of yellowthroat – Grey-headed, Olive-crowned and rarer than both of these a Common Yellowthroat. With a Striped Cuckoo showing well we also got very good views of the outrageous Pink-billed Seedfinch with several smaller Thick-billed Seedfinches for comparison. Two Blue Ground-Doves flew over and amongst the marshes and small ponds were Green Herons, Solitary Sandpiper and a surprise was a very confiding Sora. Satisfied with our day we returned to the lodge for a well deserved evening meal. Moving on we came across small groups of birds including Tropical Parula, Tennessee and Wilson’s Warblers a Smoky-brown Woodpecker and then sat in a dead tree beside the road was a fantastic White Hawk. We slowly descended and found Orange-billed Sparrow, Silver-throated Tanagers, Golden-winged Warbler and then incredible close views of a male Red-headed Barbet. A pair of Immaculate Antbirds put on a perfect show while a Pale-vented Thrush was seen by just about everyone. Almost to the bottom we watched a pair of Golden-bellied Flycatchers and a very close Emerald Tanager. On the river itself we got to see a pair of American Dippers and a dainty little Torrent Tyrannulet just before the rains started forcing us to jump back into the coach and make our way back towards our lodge. An hour’s stop at a café with hummingbird feeders and fruit put out on bird tables, as well as hot drinks and freshly made snacks and biscuits for us, proved to be an excellent break from the rain. Coming to the hummingbird feeders and sitting around close on twigs and small branches were Green-crowned Brilliants, Violet Sabrewings, a pair of Green Thorntails, a White-bellied Mountaingem, and a couple of Coppery-headed Emeralds. In the gardens and taller trees we located Blackburnian and Wilson’s Warbler, as well as Olivaceous Woodcreeper, Red-faced Spinetail, Crimson-collared, Speckled and Spangle-cheeked Tanagers. A really good bird for the gardens and giving us superb views was a Sooty-faced Finch, while Yellow-throated Brush Finch was also spotted. The café’s pet Tarantula managed to get hold of Brian C and once we’d saved him we set off, again calling in to a pond, but because of the rain we never saw anything new. We had lunch and loaded our bags and said goodbye to a great lodge and a wonderful base for some excellent birding. As we were about to go one of the staff showed us a Red-eyed Tree Frog that he had found – superb! Before leaving the area completely we decided to just check out the approach road to Le Selva once more. A short walk and only Kev got the briefest view of a Tiny Hawk flying off with a kill. Having seen where he thought it might have landed we walked the trail to view the area. As we were turning around to go I spotted the bird land in another tree where we got superb scope views of this gorgeous male. We then had very close encounters with a male Red-throated Ant-tanager and some even closer views of Strawberry Poison-Dart Frogs. Back on the coach we set off to our next destination of Rancho Naturalista. We broke the journey with a stop in the middle of a small town where we visited a supermarket and got some cold drinks as well as watched one of Costa Rica’s most recent arrivals, a Tropical Mockingbird. Completing the rest of our journey we arrived at Rancho just before dusk. Early morning coffee and biscuits on the veranda had us watching a multitude of hummingbirds just inches away. Amongst these gems were lots of White-necked Jacobins, Crowned Woodnymphs, and fewer Green-breasted Mangos, Rufous-tailed Hummingbirds, Brown Violetear, Green Hermit, Purple-crowned Fairy, Little Hermit and a pair of Snowcaps. Bananas and rice had also been put out in the garden and this was soon attracting Grey-headed Chachalacas, Montezuma’s Oropendolas, and a host of other species including Passerini’s, Blue-grey and White-lined Tanagers. After breakfast we set off to the bottom of the Tuis valley. A fairly short walk found the area to be rather quiet but we proceeded with our plan to make a thorough search. A small flock contained Tropical Gnatcatcher, Tropical Parulas, Black-and-white Warbler and Golden-hooded Tanagers, while further along from the bridge a couple of Torrent Tyrannulets showed well hopping around on the rocks. We continued our search, but try as we may we could not find the legendary Lanceolated Monklet, maybe three years in a row was asking a little too much! As we made our way back to the coach Yellow-bellied Flycatcher, Streak-headed Woodcreepers and Piratic Flycatcher were found. Back at Rancho we had our lunch and then some of us watched from the balcony where the only different species from this morning were a young male Black-crested Coquette, Violet-headed Hummingbird and Yellow-billed Cacique. Taking a walk around the trails of Rancho we were straight away greeted by a roosting Mottled Owl sat just a foot or so off the ground. Further on, the forest hummingbird feeders held lots of Snowcaps, Green Hermit and White-necked Jacobins, Green Thorntail and Brown Violetear amongst others. The main forest proved very quiet but we all got excellent looks at a male Slaty Antwren and then a little later a Purplish-backed Quail-Dove sat on a fallen tree allowing a brief but good view. A few other species seen on our walk included White-ruffed Manakins, Spotted Woodcreeper, and finally a Whistling Wren which was seen going to roost in a hole in a bank. Today we split the group into those who wanted to and were able to, going on an all day very tough steep hike, and the remainder working the forest tails of Rancho with the resident guide. A Tawny-chested Flycatcher was seen first thing in the morning and then those of us on the hike set off on a short drive to the start of our walk. With our picnic lunches in our rucksacks we set off following a track which soon crossed over a stream and then turned into a cattle trail – a thin muddy, steep and very winding route up into a misty mountain forest. The first hour was very quiet with very little to see, although we did scope a perched Ruddy Pigeon and several Chestnut-headed Oropendolas flew over. As we climbed higher we found Dark Pewee, Golden-olive and Acorn Woodpecker and then superb views of a male Blue-hooded (Elegant) Euphonia. Up near the beginning of the forest we started to see our first interesting birds. With Rufous-browed Peppershrike a good catch-up for some of the group we then had an excellent bird, a Yellow-bellied Sapsucker. Blue-throated Toucanets called all around us and a flock of Sulphur-winged Parakeets flew past. We then heard and got poor flight views of a group of rarely seen Red-fronted Parrotlets. Moving on into the forest we soon heard a Buff-fronted Quail-Dove and after a half hour wait only myself and Russ managed to get a glimpse of the back-end of the bird as it walked across the trail and disappeared. We decided it was not a good enough view to go on our list! Moving on we next encountered a male Black-and-white Becard later followed by a superb mixed flock of which the highlight surely had to be the stunning close views of a pair of Rufous-rumped Antwrens. Also in the flock were Tufted Flycatcher, Common Bush-Tanagers and a few warblers. We had good looks at Ruddy Treerunner and a pair of Buff-throated Foliage Gleaners, as well as a very nice male Black-bellied Hummingbird. With all these excellent birds around we soon forgot about being worn out and covered in mud. A thin high pitched call then gave away the presence of a Sharpbill and we scoped the bird sat in a tree top. Crossing from one forest to another section across some grassy pasture we found Slaty Spinetail and a very showy Blue-hooded Euphonia. About four hours after we set off we arrived at another open pasture area within the forest. Here we got very good flight views of three more Red-fronted Parrotlets plus Yellow-throated Brush-Finch and then our main target species which was well spotted on a distant tree by Ian, an almost unbelievable bird in both colour and rarity value – a male Lovely Cotinga. It soon disappeared so we settled down and had our picnic. Behind us a Resplendent Quetzal called and then flew across the open sky with metre long iridescent streamers flowing behind. Kev then spotted a closer perched female Lovely Cotinga which we had prolonged scope views of as well as a Hairy Woodpecker and then another male quetzal flew into a tree and posed very nicely for us. Over the next half hour we all got the most stunning views of a couple of male Lovely Cotingas which came to some close trees and even perched in a bare tree top. This was one of the main reasons for all our efforts in getting here, and was well worth it. It was now time to start our journey back down and as we were about to leave the pasture a Black-thighed Grosbeak was spotted singing from a huge tree. Later a small flock was encountered and amongst its participants were a high up Rufous-browed Tyrannulet, a female White-winged Tanager, Tropical Parula Yellow-throated and Brown-capped Vireo. Out of the forest we then heard a Costa Rican Pygmy-Owl which flew into a thick tangled tree and was never going to be seen, especially when a Barred Forest Falcon started calling within the same tree but unfortunately never showed itself to anyone other than myself. As we continued our exhausting journey back down the mountain it began to rain so speeding up we eventually crossed over a stream and then arrived back at the coach where Pablo awaited. We then returned to Rancho where a few of us had a quick look at the hummingbird pools – a stream with little bathing pools inside the forest. Snowcap and Crowned Woodnymph were having a bath, a Dull-mantled Antbird came in, and Whistling Wren whistled! The other group spent the day in a more relaxed style and worked the forest trails of Rancho with Jason the resident guide. They also enjoyed a very nice meal at lunch time. The highlights of the many species that they had encountered during the day included Checker-throated Antwren, Plain Antvireo, Rufous-winged Woodpecker, White-capped, White-ruffed and White-collared Manakins plus Dull-mantled Antbird, Acadian Flycatcher, American Redstart, Long-billed Gnatwren, Scale-crested Pygmy-Tyrant and a Thrushlike Schiffornis. After early morning coffee on the balcony where several people saw a Short-tailed Nighthawk fly past, we took a short walk into the forest. We heard a close Little Tinamou but it could not be enticed to show itself and when the rain started coming down we decided to make a quick retreat. A change of plan then saw us board the coach and drive to a nearby area of wet fields. A Striped Cuckoo showed itself as did a Roadside Hawk and Tropical Pewee. White-throated Crakes could only be heard but in the far corner of the fields we got superb views of a very localised species, a White-throated Flycatcher. Moving on a little to a river running through a wooded valley everyone dived out of the coach when a brightly coloured Coral Snake was seen crossing the track. We then searched the river and Rob spotted our target bird, a Sunbittern, which flew a short distance and disappeared. We continued our search and eventually after hearing it call Brian spotted the bird and everyone that was there at the time got to see this beautiful, strange and much wanted species. In the same area we also spotted Black-headed Tody-Flycatcher, female White-collared Manakin and a Buff-rumped Warbler. We then returned to Rancho for breakfast. After collecting our luggage and loading up the coach we took a slow walk down the entrance road. Several species were seen including a Worm-eating Warbler, Blackburnian Warbler, Crimson-collared Tanager and Collared Aracari. Boarding the coach we set off towards our next destination with several planned stops along the way. Our first stop at a pond soon had us scoping Killdeer, Blue-winged Teals, Least Grebe as well as Spotted, Solitary and Least Sandpipers. Moving on, our next stop on a dam allowed us fantastic views of a male Bat Falcon perched on a wire just below us. We even watched him fly off and catch a huge morpho butterfly. Back in the coach we continued on stopping to look at another small pond near Catargo which produced American Coot and Moorhen, as well as Lesser Yellowlegs and lots of Blue-winged Teal. On again and a Red-tailed Hawk was seen, followed by a short stop beside a grassy field where a couple of Sedge Wrens were soon added to our list. We drove out of the old city and started climbing higher towards cerro del muerte. Stopping at a small roadside café we got permission to have our packed lunches, while also having a nice mug of coffee or tea. Just outside the café our first highland species were seen including a Yellow-thighed Finch, Slaty Flowerpiercer, Mountain Thrush, Wilson’s and Black-throated Green Warblers, brief views of Ruddy-capped Nightingale-Thrush and for some of the group our first Long-tailed Silky-Flycatchers. We then continued ever upwards and at a height of around 9,000 feet we stopped and searched a small section of road that can generally be productive. Getting out of the coach we were greeted by a cool temperature and then excellent views of a pair of Black-and-yellow Silky Flycatchers. Sooty-capped Bush-Tanagers were easily seen and a very showy Black-billed Nightingale-Thrush completed all the possible nightingale-thrushes for Costa Rica Further along the road we found more Black-and Yellow Silky Flycatchers, plus Hairy Woodpecker, a very nice Flame-throated Warbler and superb close views of a very good bird, an Ochraceous Pewee. Moving on a little we saw two Black-capped Flycatchers, followed by Black-cheeked Warbler and at the bottom of a hill beside a stream we heard the distinctive high pitched call of a Zeledonia. Leaving the area we drove to an even higher elevation before turning off on a small road that would take us to our wonderfully positioned lodge. On the road down we saw many Sooty Thrushes plus a couple of Spotted-crowned Woodcreepers. Beside the road at dusk we got to hear Buffy-crowned Wood-Partridge and several Dusky Nightjars. After a few more minutes driving we arrived at our lodge. This morning was pretty cold compared to all our other previous stops. We spent half an hour just watching from the road beside the restaurant adding a handful of new species. On the feeders were White-throated Mountaingems, Magnificent Hummingbird, Green Violetear and both Scintillant and Volcano Hummingbirds. Black Flowerpiercers worked their way around the flower beds and we got excellent views of a pair of Flame-coloured Tanagers. After breakfast we awaited a small truck which was to take us up into the forest. While waiting several people saw a group of Cedar Waxwings flying around, plus three Yellow-bellied Siskins and a very close Mountain Elaenia. We boarded the truck and were taken unceremoniously up into the huge Oak forest. We arrived and within two minutes a Costa Rican Pygmy-Owl was heard calling and immediately spotted by Kev sat high in the canopy where we all had fantastic scope views. In the distance we could hear Spotted Wood-Quail a bird we have never seen yet, while closer the call of Black-faced Antthrush was a bit of a surprise. We slowly walked a trail and found a small flock containing Lineated Foliage Gleaners and Collared Trogon and then higher up while trying to locate a calling Buff-fronted Quail-Dove, we got distracted when a group of Silvery-throated Jays appeared. After some time, everyone managed to get good views of these highly active birds plus a tricky Buffy Tuftedcheek. We made our way slowly back to a different trail seeing another Buffy Tuftedcheek, some Yellow-winged Vireos and Spot-crowned Woodcreepers along the way. Where the trail followed a small stream we met several flocks which contained Sooty and Common Bush-Tanagers, an Ochraceous Pewee, Hairy Woodpecker, Black-cheeked, Wilson’s and Flame-throated Warblers, Ruddy Treerunner and then a little later on a group of about twenty Central American Spider Monkeys. We eventually came out of the forest and walked back down the road to the lodge. Another small flock was encountered and we managed to get very good views of an Olive-striped Flycatcher. White-collared Swifts flew very low overhead and a Ruddy-capped Nightingale-Thrush showed to several of the group. We then had our lunch and a short break before travelling a few minutes down the road. A close and very obliging Ruddy-capped Nightingale Thrush forced us out of the coach where we also found a Black-thighed Grosbeak with a nest, Acorn Woodpeckers, Long-tailed Silky Flycatchers and a female Resplendent Quetzal. Further along in a small area of wood we watched Yellowish Flycatcher, Ruddy Treerunners, Black-throated Green Warbler, Spotted-crowned Woodcreeper, and Flame-throated Warbler, and while everyone was focused on anything else they could find, Ian had looked behind us and called as a group of ten Spotted Wood-Quail made their way across the track one by one. We all got fantastic close views, I got a lifer and Ian earned a well deserved beer for spotting them. On a high, we returned to the coach where a superb male Resplendent Quetzal posed very nicely allowing for some good photos. We drove back up the road past the lodge and checked an area beside an orchard. A Flame-coloured Tanager showed well as did a couple of Large-footed Finches. Next we found a small open valley which we walked into and waited until dusk where we spotlighted a Dusky Nightjar making a fitting end to another great day. This morning we took a short pre-breakfast walk into a section of nearby forest. Unbelievably one of the first species we came across was a group of six Spotted Wood-Quail which walked across the track right in front of us. A male Resplendent Quetzal showed, but we had no luck trying to locate a Barred Forest-Falcon. As we headed back for breakfast Black-capped Flycatcher, Flame-coloured Tanager, Philadelphia Vireo, Acorn Woodpecker, Black-thighed Grosbeak, Collared Redstart and Ruddy-capped Nightingale-Thrush were all seen. After we had eaten, we collected our luggage, loaded up the coach and set off towards the high paramo. A stop along the way got us excellent views of several female Yellow-bellied Siskins, while the males only showed briefly. Our next stop was at the highest point of around 11,000 feet where the vegetation was now low scrub with a few smaller trees. We soon spotted our first Volcano Juncos and later got to see several more. Broad-winged Hawks passed over in a small group and then a party of eight Swainson’s Hawks flew over. Timberline Wren showed well to everyone and we then tried a short trail just a little lower down. Large-footed Finch and Black-billed Nightingale-Thrush were seen, followed by Sooty-capped Bush-Tanagers and Black-cheeked Warblers, as well as another Black-capped Flycatcher. Leaving here we drove to a roadside café where a drink was enjoyed while watching lots of Fiery-throated Hummingbirds at very close quarters. Moving on again we arrived at another café where we had lunch. While waiting for our meals to arrive we watched from the balcony and saw an excellent variety of species, with pride of place going to a male White-tailed Emerald and then Chestnut-capped Brush-Finch, followed by a Grey-necked Woodrail, Cherries, Silver-throated, Speckled, and Golden-hooded Tanagers, Violet Sabrewing and a close fly past by a Swallow-tailed Kite. After our meal we continued on to our lodge near San Isidro. As we drove down the entrance track an Olivaceous Piculet was spotted and after getting out and seeing it again we also found a couple of Streaked Saltators and a Lesser Eleania. Down near our cabins a fruiting tree held lots of Red-legged Honeycreepers, and as we were settling into our rooms a Fork-tailed Flycatcher was spotted, as well as a very showy Scaled Pigeon. With a few hours of light left we then searched the gardens. More Scaled Pigeons were seen and an Olivaceous Piculet showed well to everyone. Overlooking some grassy fields we got brief views of Pale-breasted Spinetail and a Mourning Warbler and then Brian C found a superb Pearl Kite sat in a tree. A little later we noted three of these dainty little kites sat in the same tree. A couple of Red-crowned Woodpeckers also showed well before we walked another trail back towards our cabins. Streak-headed Woodcreeper was seen alongside Yellow-bellied Eleania, and a Swainson’s Thrush. Beside the cabins we got to see Blackburnian Warbler, White-winged Becard and then as the finale to our day an adult female and two juvenile Turquoise Cotingas who eventually huddled together under a branch to roost. An early morning walk around the gardens before breakfast produced three Pearl Kites, a Garden Emerald, Pale-breasted Spinetail, two Mourning Warblers, Olivaceous Piculet and a superb Yellow Tyrannulet. After breakfast we drove to an area where we soon located Smooth-billed Anis, a Tropical Mockingbird and then after a bit of a search and excellent views by all of a Pale-breasted Spinetail we got very good views of a Fork-tailed Flycatcher before it flew off. Continuing on to another area of open grasslands we got to see a superb male Red-breasted Blackbird and a roadside Lineated Woodpecker. Checking another forested road Rob made a superb spot from the coach of a female Turquoise Cotinga which we got out to look at. We also got to see a few Chestnut-collared Swifts fly over. It was then time to leave, and with possible traffic delays we needed to drive back to San Jose without anymore stops. Perfect timing to the airport, we said goodbye to Kevin who excelled himself as always, and Pablo our wonderful driver. After a very short delay in catching our flight we eventually arrived back in London the next day - the 5th April. I would like to extend my gratitude to Kevin on this world record breaking tour, and to everyone else for making it such fun to lead.